At your wit’s end trying to figure out how to get a puppy tired? Read on for five fantastic exercises to burn off a puppy’s endless supply of energy. 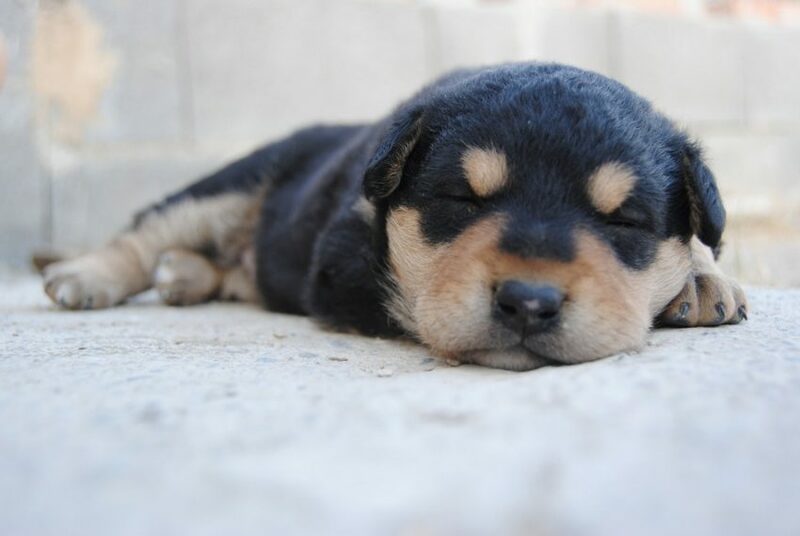 To grow big and strong a puppy needs a lot of sleep every day. However, when they are awake them make up for all that time spent napping on the couch. So, what can you do to tire the little fellow before the puppy ruins everything around? Well, I’ve got five out-of-the-box suggestions for you below. Dogs are hard-wired to chase, so they can hardly resist a moving target. You can use this instinct to tire out a puppy by blowing bubbles. Out in the yard or indoor in the living room, blow some bubbles and enjoy as the little one race around trying to catch them. It’s an excellent exercise because it doesn’t require much on your part, and you can do it anywhere anytime the little pooch gets restless. What’s more, you can purchase special dog bubble formulas that smell like bacon. No puppy will say no to such a treat or edibles dog bubbles. In addition to this, you can also get a bubble machine to keep your puppy stimulate when you have too much work to do and don’t have time to entertain him. Just remember to wipe your puppy’s face if you play with soap bubbles because the mixture might irritate his eyes. Another way to wake the chasing instincts of a puppy and get him moving around the house is by using a flirt pole . It’s the equivalent of a cat’s fishing pole lure. Yes, dogs are not cats, but they also love to pounce on moving things. You can buy a flirt pole or make one by yourself. You just need a stick, a long rope, and a rag or an appropriate stuffed toy. Then you drag the toy around keeping it just out of reach of the puppy’s eager mouth. Before you know it, the little one will be running around trying to catch the toy. Since the point of the exercise is to tire the puppy, you should not let Beau catch the toy unless you want to play tug-of-war. Children love to play hide and seek with their parents and siblings. Puppies are not different. So, another way to tire an energetic puppy is to play hide and seek. It’s easy. Attract the attention of the puppy, then run away and hide behind a sofa or a couch. Call the pooch by name and wait for Beau to find you. This exercise is an excellent way to stimulate not only the puppy’s feet but his brain too. The little pooch will rely at first on the sound of your voice to locate you, but then he will start using his nose as well. However, keep it simple at the beginning because the puppy will lose interest. Make it more challenging when Beau grows up. Unfortunately, you don’t always have the time to play hide and seek with your puppy. So, instead you can hide treats around the house and let the puppy snuff them out. While the puppy is in the other room, hide a couple of treats in easy to find places. You might point to the treats if the puppy is not interested. Your puppy will get better at finding food and treats so that you can try more challenging places, for example, under a pillow. Classic Kong toys – fill them with kibble and watch as your pooch tries to get to the tasty treats. Hide-A-Squirrel – these toys consist of a larger toy filled with squeaky toys, which your dog will love to take out! A babble ball – these types of toys make animal sounds to attract the attention of the puppy. A flip board/A sliding puzzle – your furbaby will have a whale of a time figuring out how to flip/slide the compartments and get the treat. Interactive ball launcher for those puppies that love to play fetch. While you want to tire your puppy, you have to be careful not to overtire him by accident. Young animals do not have the same endurance as adults. Always supervise your puppy when he is playing with things that are small enough to swallow. In addition to this, throw out toys that have been damaged. Do not make the puppy jump too high, hurl over obstacles or run too much. He is too young, and his bones are developing. Watch out for signs of exhaustion like panting. Always reward and praise the puppy after each playing session. Don’t forget to fill the water bowl. Every puppy has a unique character and preferences. Your little one might not want anything to do with bubbles, but he might love the flirt pole. Don’t be afraid to experiment. And don’t forget to teach your puppy the basic commands every dog should know. 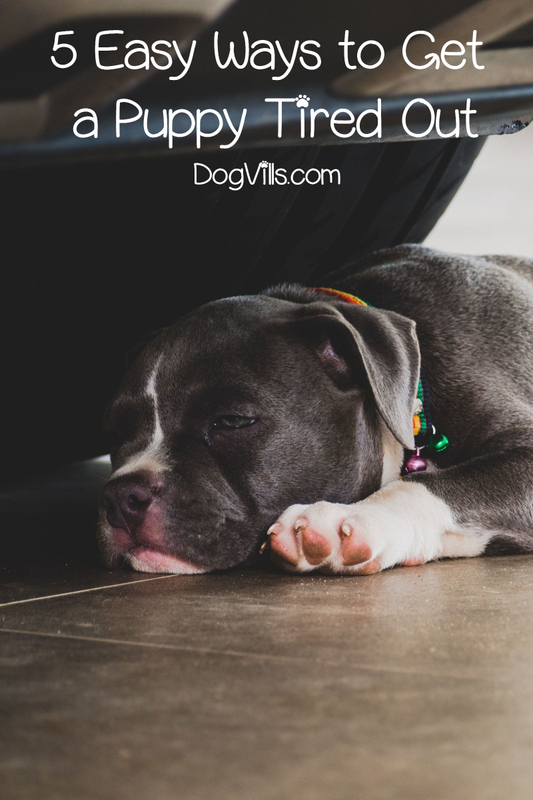 What do you think about these five ways to get a puppy tired? How do you do it? Share your experience in the comments!